The waterfalls – Raise your hands if you don’t like waterfalls. Yeah, crickets chirp, just as I thought. Wispy Cataract Falls, near Sugarlands Visitor Center, is the most easily-accessible. 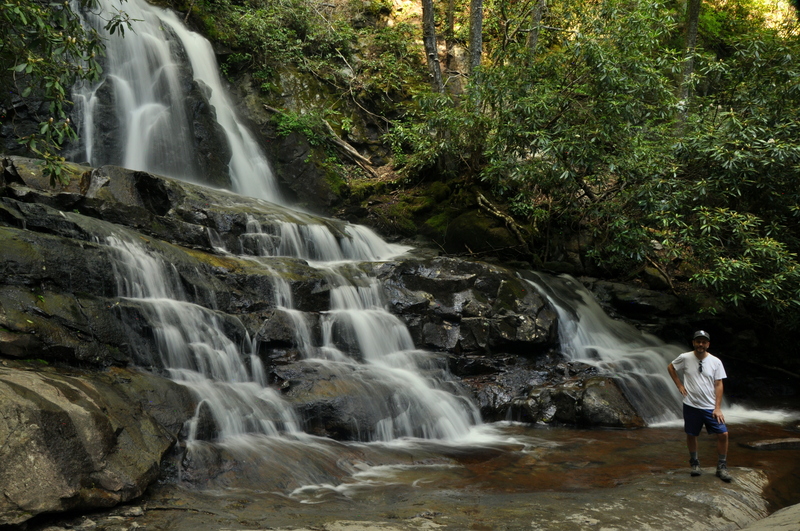 Multi-tiered Laurel Falls, beneath Cove Mountain (and pictured below), is the most popular. Roaring Abrams Falls, in the back country of Cades Cove, is the most powerful. 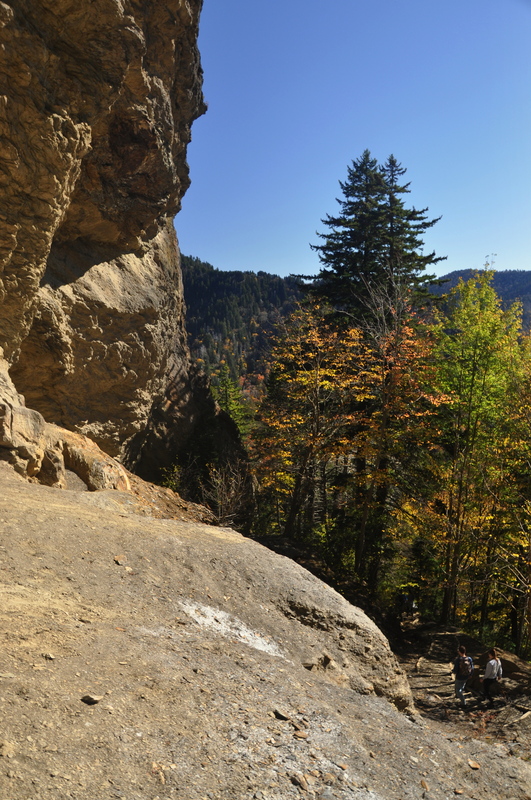 The history – Geologists and historians have uncovered several millennia of natural and anthropological history related to GSMNP. The park’s website is a veritable potpourri (love that word) of information. 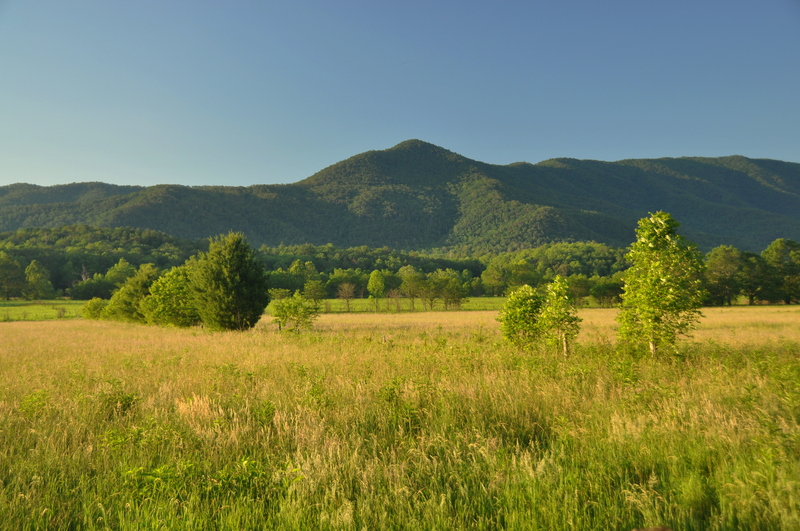 Cades Cove features a treasure trove of historic buildings, including three one-room wooden churches and a grist mill from when the area was its own town. 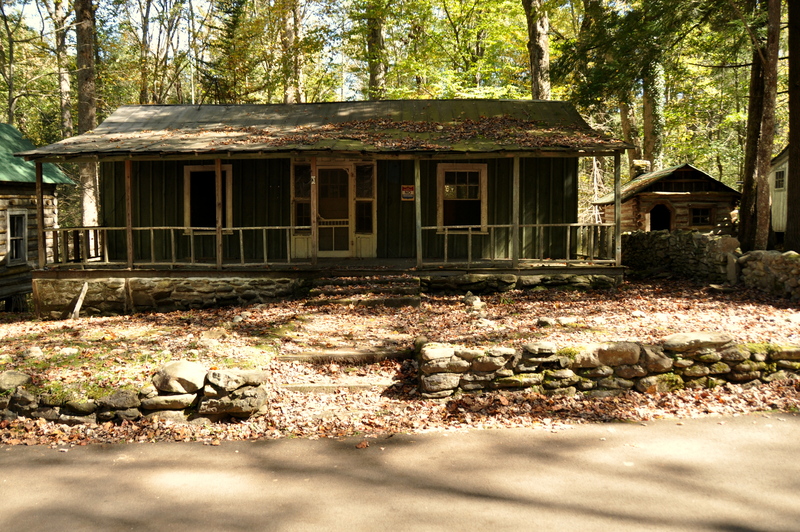 A nature trail behind Sugarlands Visitor Center leads to the historic McCarter and Ownby cabins, two of several throughout the park. Elkmont, midway between Cades Cove and Sugarlands (and pictured below), is a collection of mid-century homes and cabins that have been left to nature, and feels like a sort of forgotten A-bomb testing community from the 1950’s. The mountains themselves are estimated to be 500-600 million years old, dating back to a geologic era when the Appalachians were twice as tall as the Rockies. We sometimes forget that mountains, like people, are living things. The wildlife – Over several visits to the national park, I have seen bears, snakes, wild turkeys, and more deer than I can count. Each animal encounter passed without incident, and was more thrilling than scary. If you camp overnight, use bear canisters and secure your food stash over a tree. If you stumble upon a rattlesnake or a copperhead, stop and give it a chance to move out of your way, lest the snake feel cornered. Keep a safe distance from bears whenever possible…and don’t feed them! Bears that develop a taste for people food lose their natural inhibitions and must often be euthanized. Also remember that dogs are not allowed on any of the park’s trails. The trails – As I wrote in an earlier paragraph, 900 miles of marked trails traverse the hills, valleys, and woodlands of GSMNP. For my part, I have hiked barely a fraction of them…and enjoyed every step. Abrams Falls Trail – a medium-length hike, five miles round-trip, that is perfect for families that have packed a lunch. 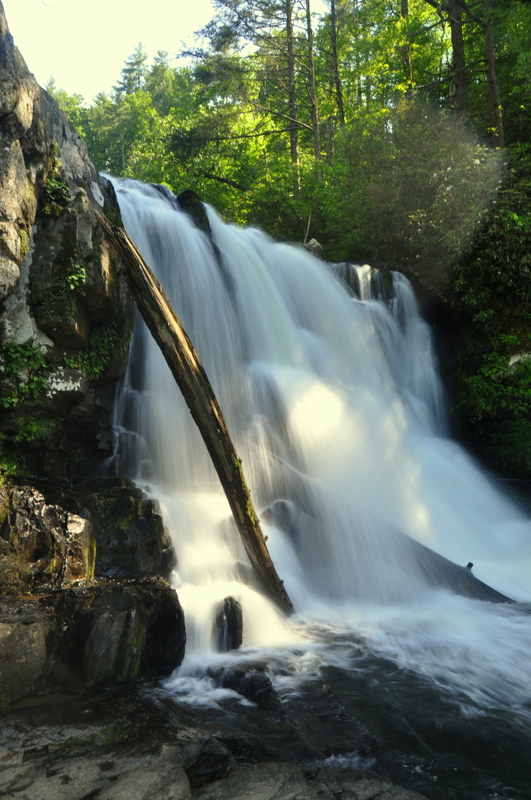 The aforementioned Abrams Falls, accessible from western Cades Cove, is the destination in question, and the elevation gain and loss along the trail is moderate. GringoPotpourri note: do not swim in the pool beneath the falls – the undertow has claimed several lives. Alum Cave Trail – possibly the loveliest trail in the park, the Alum Cave Trail crosses the creek of the same name several times and passes through – yes, through – Arch Rock as it winds to the bluffs that are Alum Cave itself. (As you can see in the photo below, it isn’t really a cave.) 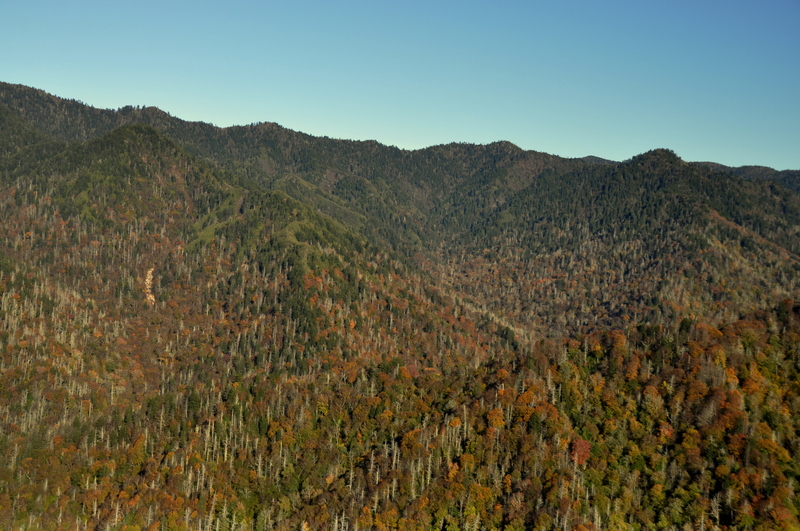 The hearty can hike all the way to Mount LeConte, the most prominent peak in the park and its third-highest – a calve-burning 10 miles round-trip. 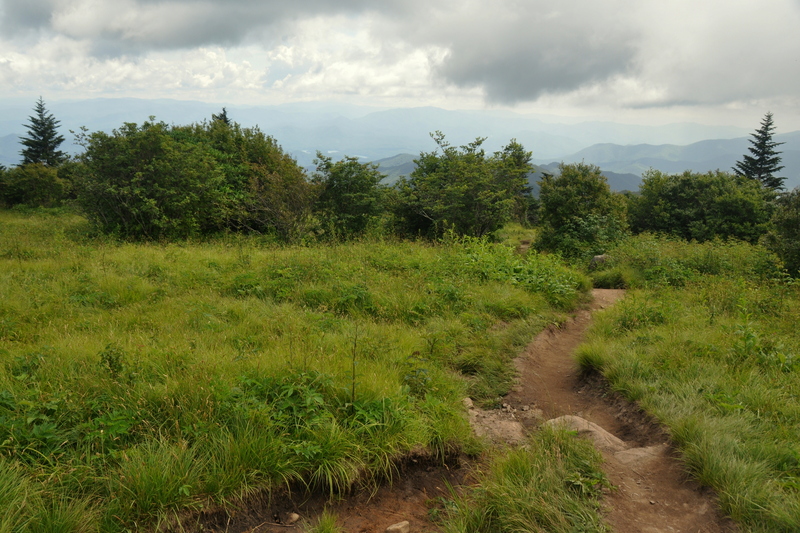 Andrews Bald Trail – the too-small parking lot at the end of Clingmans Dome Road is the trailhead for this rocky trail to one of several “balds” – grassy, near-treeless, high-altitude meadows. Though just four-miles round-trip, my knees took a real beating on this hike. 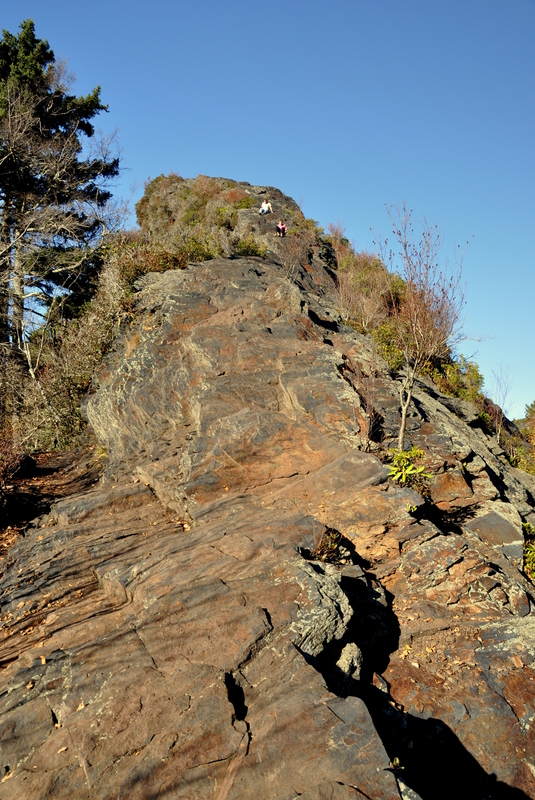 Chimney Tops Trail – The titular rocky outcroppings that mark the literal and figurative high point of Chimney Tops Trail have been closed to the public ever since the fires of 2016, and probably won’t reopen anytime soon. As such, a hike along this trail today is about the journey, not the destination. Expect lots of bridges, CCC-laid rock steps, and a blanket of fallen leaves upon which to hike each October. Still a gem. Cove Mountain Trail – the first mile of this popular trail is paved, and doubles as the handicapped-accessible trail to Laurel Falls. As such, you won’t find much solitude. 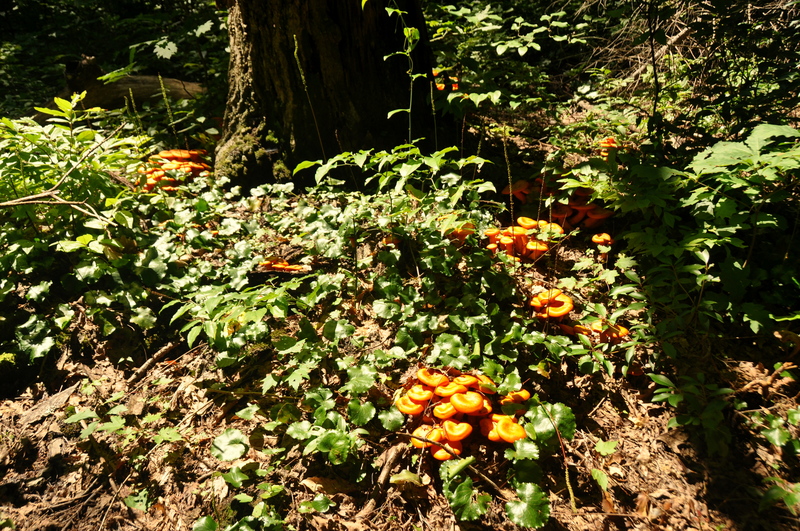 Past the falls, however, crowds disappear and it’s just you and nature (including a striking, forested hillside of orange mushrooms, pictured below) all the way to the fire tower atop Cove Mountain. Be warned, though: the tower itself is off-limits, and the base of the tower is still below treeline, meaning that there isn’t much of a view. The colors – The park is beautiful at any time of year. Winter, when many of the trees have shed their leaves, is a great time for spotting deer and elk. Spring finds flowers in bloom and bears out and about. Summer has long daylight hours and unrestricted access to high-altitude trails. For me, though, autumn is the best time of year for a visit. The fall colors in GSMNP are something to behold. It is hard to pinpoint peak leaf-peeping season; it peaked early during my first visit to the park in 2010, but didn’t arrive until early November this year. In addition to the aforementioned Alum Cave and Chimney Tops Trails, you can also find beautiful fall foliage in Cades Cove (particularly around the Cable Mill Visitor Center), along Laurel Creek Road, and, as pictured below, at the stunning Newfound Gap Overlook. 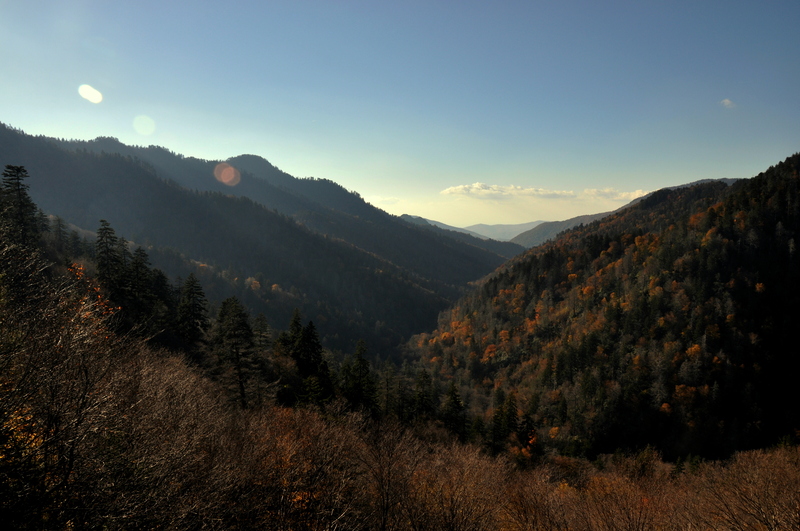 The price – Admission to Great Smoky Mountains National Park is, and will always be, free! Thanks to Newfound Gap Road, the north-south parkway that traverses the park from Gatlinburg/Pigeon Forge in the north to Cherokee, NC in the south, the park’s bylaws deem that entrance always be free. Traffic and parking – Ho boy. Weekdays and shoulder season are the best times of year to visit GSMNP. The rest of the time, you may have to fight for a parking spot, especially at such popular spots as Sugarlands Visitor Center and the parking lots for Clingmans Dome, Laurel Falls, and Charlies Bunion (yes, that’s a real place). 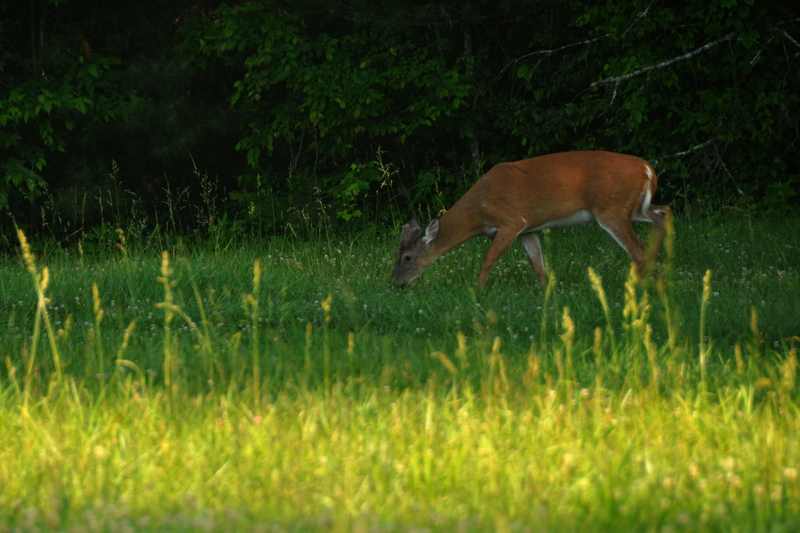 The one-way, 11-mile loop road that circles Cades Cove is a veritable parking lot much of the time, thanks largely to people who hit the brakes to photograph deer grazing along the side of the road. Expect the drive to take an entire day, especially if you stop off at various points of interest – of which there are many. I already mentioned that Newfound Gap Road connects Tennessee and North Carolina, and while it isn’t exactly the 405 Freeway in Los Angeles during rush hour, it has a steady stream of traffic as vacationers drive from their lodgings in Pigeon Forge to the casinos in Cherokee to try their luck. My hike to the aforementioned Andrews Bald took place on the Friday over July 4th weekend. I won’t tell you exactly how long it took to drive through Pigeon Forge or to wait for a parking space to open up at the end of Clingmans Dome Road except to say that I spent so much time idling in my car that I finally had to pee into my coffee thermos. Do with that information what you will. Visibility and weather – We know by now that mountains make their own weather, and that is never more apparent then at GSMNP. 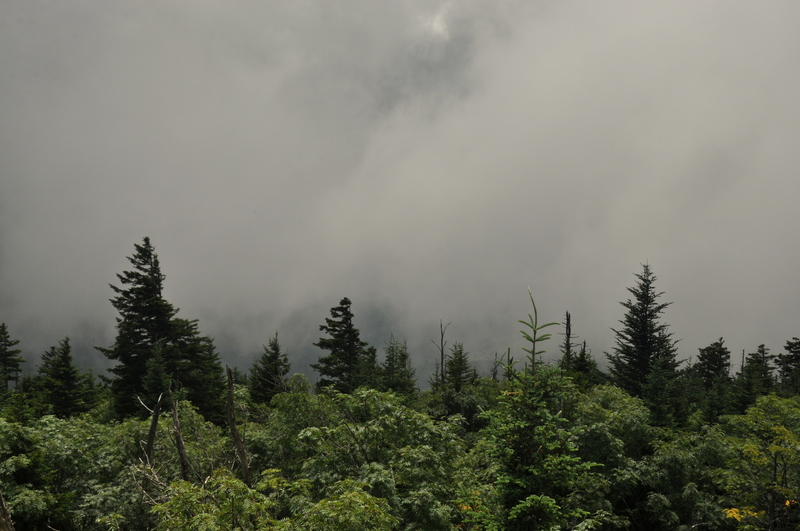 It may be hot and sunny in Pigeon Forge, but overcast and chilly atop Clingmans Dome, where the park gets three times more precipitation than the rest of the surrounding area. Indeed, above 5,000 feet the old adage applies that states, “If you don’t like the weather, wait five minutes.” Except at Clingmans Dome, in five minutes the visibility may get worse, not better. The ever-changing weather suggests that many of the park’s otherwise-great trails are muddy…pretty much all the time. Don’t hike in sandals. Speaking of visibility, the “smoky” of the name Great Smoky Mountains National Park refers to the blueish haze that seems to tint the mountains and, from afar, the sky immediately above them. I once thought that it was smog – a forgivable misconception considering the number of cars traversing the parkway each day – but I later learned that the blue haze is vapor released into the atmosphere from the park’s vegetation. 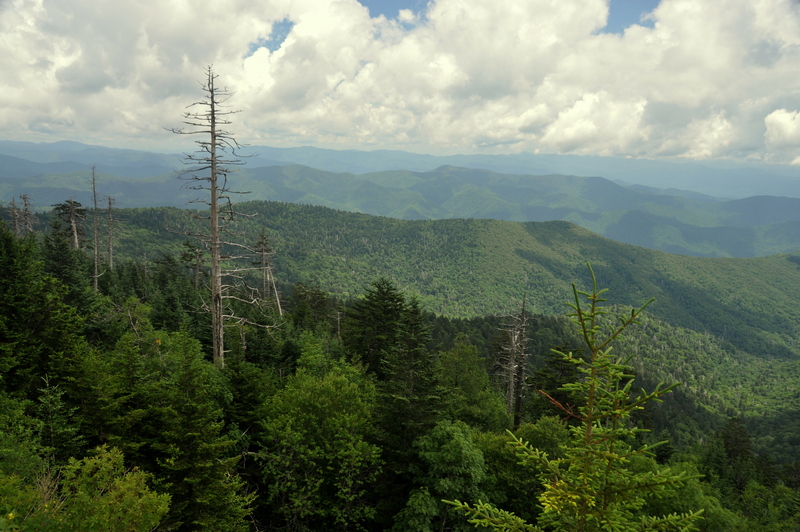 And here’s a bit of history: the Smokies were called “Shaconage” – “place of the blue smoke” by the Cherokee Indians who lived in the area long before the white man. 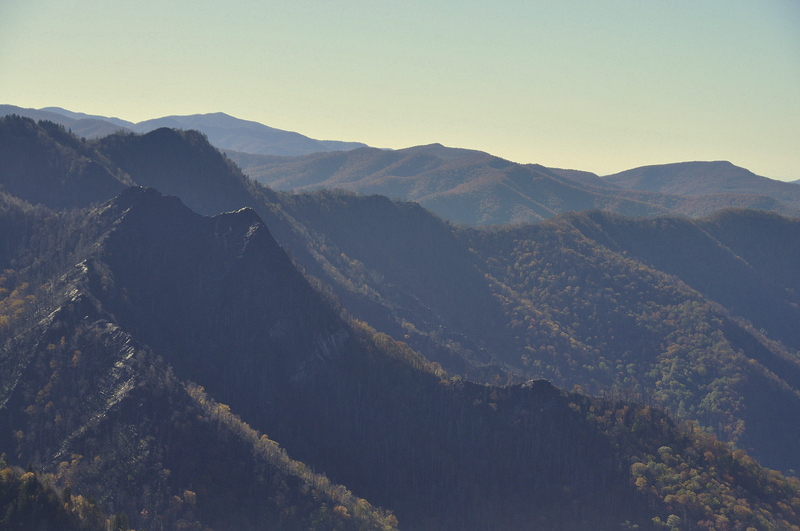 Distances – With 800+ miles of trails spanning two states, GSMNP is huge. Traveling from one side of the park is sometimes easier said than done, and sometimes downright impossible. 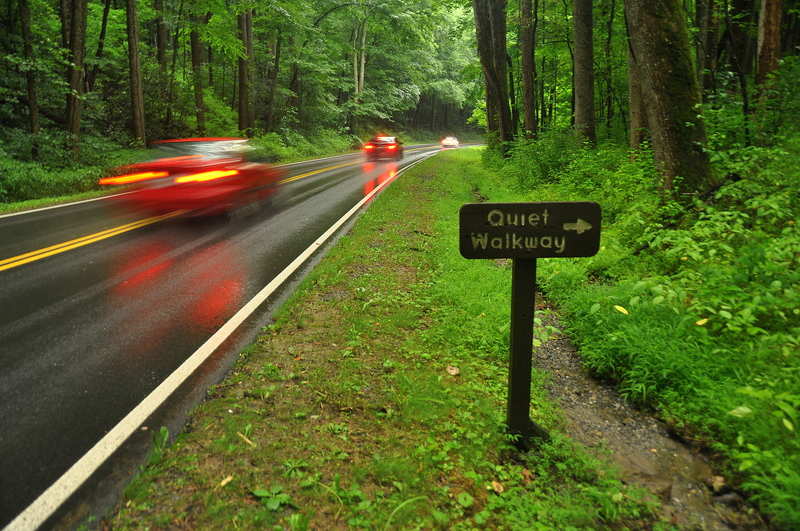 Although it isn’t even 30 miles from, say, Cades Cove to Sugarlands Visitor Center, the drive can take an hour. The Big Creek Entrance, near Exit 451 of I-40, is a two-hour drive from the Fontana Dam Entrance, south of Knoxville’s McGhee-Tyson Airport. These particular entrances are linked by the Appalachian Trail, and I can’t begin to imagine how many days it would to cover such a distance by foot. Should you turn onto the wrong road – the one-way Roaring Fork Motor Nature Trail, let’s say – you’ll be inconvenienced even further. Blight – To some extent, blight is out of our control. I am not referring to the eyesores left behind when poorly-thought-out roadside businesses along, say, Wears Valley Road or Highway 321 go out of business; I am referring to the scarring from wildfires and the death of tree species by airborne spores. The balsam woolly adelgid is an aphid of sorts that was introduced to the park in 1962, most likely as a stowaway on someone’s boots or backpack, and that has killed 90% of mature fir trees in the park since then. (The needle-less pines in the image below are unmistakable.) Since 1992, the similarly-named hemlock woolly adelgid has wreaked similar havoc on the park’s eastern hemlock groves. The American chestnut tree once accounted for one out of every four trees in the Appalachians. Early last century, an airborne pathogen spread by wind across the entirety of the Eastern United States, and if not for the efforts of conservationists fighting an uphill battle, the tree would have already been lost forever. I am told that all American chestnut trees in the GSMNP have been forever lost. Hike responsibly. Do not smoke while in the woods, especially during dry or windy weather. If you hike globally, wash your boots before bringing them into this ecosystem so as not to transport foreign bio-organisms. Great Smoky Mountains National Park is not a perfect place. Traffic, visibility, limited parking, blight – all areas of concern. Still, the park, like most others managed by the perennially-underfunded U.S. Department of the Interior, is remarkably well-run. The park’s trails, historic structures, wildlife, and fall foliage are deserving of whatever acclaim they get; each, taken on its own, would merit a strong enough reason for a visit. Taken together, it is all almost too much for a normal person to take in. I have visited the park eight times, and I have barely whetted my appetite. Oh, may this magnificent biosphere outlive us all.